This video clip shows how a Mattell toy factory worked in the 1950's. I'm sure it would look a bit different today, for a start it would be based in Asia. At the beginning of the clip they show some lovely wind up toys that I wish I could buy but they are probably no longer made due to price or safety restrictions. The video follows the process of bringing a Jack in the Box to the market, thankfully we can still buy similar jack in the boxes. 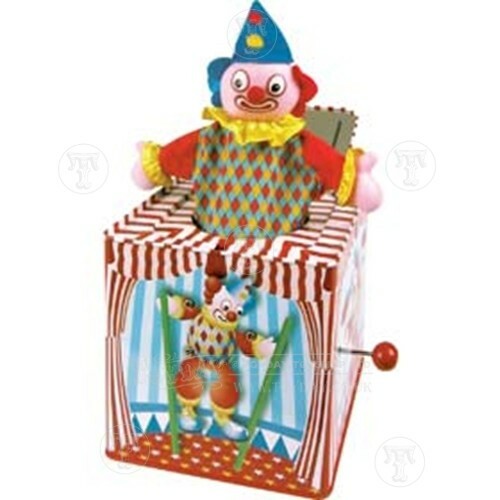 We sell some lovely jack in the boxes which look a lot safer and sturdier than the one filmed. They are still made of metal and look just as retro. They haven't changed the tune either, pop goes the weasel seems to be the classic tune for a jack in the box. It's amazing to think of both how little ( The design of the jack in the music box) and how much (health and safety, exporting) has changed in the last 60 years or so. I would so love to manufacture some toys in our own country!